It’s our biggest event of the year! 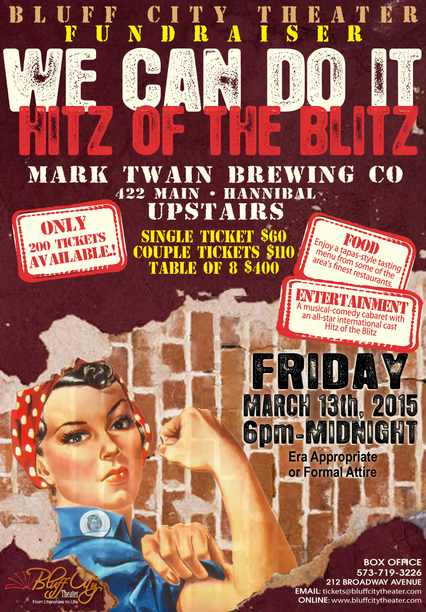 Our 2015 Gala Fundraiser will be held on Friday March 13th at the Mark Twain Brewing Company. Just like last year, we’ll have more than a dozen local restaurants providing a tapas-style tasting menu. This year’s theme is Hitz of the Blitz and we’ve assembled an international cast of musical comedy stars to entertain you, including Lisa Horner, star of stage and screen, last year’s favorite songstress Norah Long, newcomer Matt Rein and local favorites Clark Cruikshank and Jim Dewey with Greg Gibson returning on the keyboards. Plus we have some great live auction items including a week in a Costa Rican villa, a theater weekend at our sister theater in Barrie Canada, a metal art sculpture custom-made for you, a fun evening in St. Louis including a private flight and dinner with your hosts and much much more! Tickets are just $60 each, $110 per couple or bring a table of 8 for just $400. Only 200 tickets are available so book today! 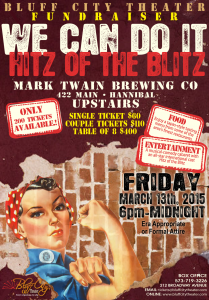 The event will be held at The Mark Twain Brewing Company starting at 6. Dress is formal or era-appropriate and we guarantee you a great night out! Call 573-719-3226 to reserve your tickets or book online here. All proceeds go to support great professional theater in Hannibal. Previous article Final Three Performances-Unfinished:The Last Fireside Chat! Next article Local Auditions- Oliver!